Conor McLaughlin lines up for Northern Ireland. England scout and radio personality Jamie Hoyland will be looking on with pride from the stands at the Parc Olympique Lyonnais today, when one of his youth proteges Conor McLaughlin steps out for Northern Ireland. 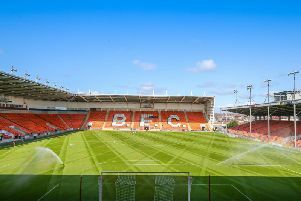 Hoyland, who is set to be at their crunch Euro 16 group C clash against Ukraine, is proud of the Fleetwood right-back, a player he scouted for Preston North End. The 50-year-old former Burnley player was a youth coach at Deepdale from 2006-2011 and knew McLaughlin would go on to big things. He told The Gazette: “He came over for a trial as a centre-half. “When I saw him as a centre-half I knew he was never going to be a central defender. “He played a couple of games for the youth team. We tried him at right-back and he took to it pretty well and went on from there. He has done brilliantly ever since he moved to right-back. “He played a lot in their qualifiers and I know they (Northern Ireland ) think very highly of him. McLaughlin played the full 90 minutes in Northern Ireland’s 1-0 opening defeat to Poland in Nice and is expected to retain his place in the side come 5pm today. And Hoyland thinks McLaughlin may catch the eye of potential suitors when the League One player lines up alongside the rest of Michael O’Neill’s Premier League defenders. He said: “I’m proud because I signed Conor after one match and I never used to do that. I knew he could play. I always used to take weeks or so to decide on a player but with Conor and (current Preston centre-half) Bailey Wright I knew on the day. “I knew after 15 minutes of watching (Australia international) Bailey that he was talented and we needed to sign him. They deserve everything they have done in the game. “I definitely think people will take note of (Conor) and a lot of people in the game speak highly of him. And Hoyland says that McLaughlin’s release from Preston, which saw the full-back contemplate quitting the game before joining Fleetwood in 2012, has made the defender stronger.